It’s not uncommon for people to crave chocolate, French fries, and other foods that are high in calories, sugar, and carbohydrates.Comfort foods provide a temporary sense of wellbeing, and they make a person feel good. Foods high in sugar, fat, or salt tend to elevate mood by stimulating the brain’s reward system. In fact, according to Psychology Today, the same reward and pleasure centers associated with drug addiction are active when comfort foods are consumed. People often use comfort food to self-medicate. Those with negative emotions tend to eat unhealthy food in an effort to experience the instant gratification that results in good – though short-lived — feelings. Although this link is persistent, doing so can actually increase negative feelings rather than quell them. A high-carbohydrate meal can cause one to physically and emotionally crash. Still, individuals consume such food items, as they associate them with comforting, secure times and special occasions. The smell of comfort food can draw one in to take a bite, as there is such a strong connection between scent and emotional memory. Craving a food might mean nothing more than the person is in the mood for something sweet or salty. 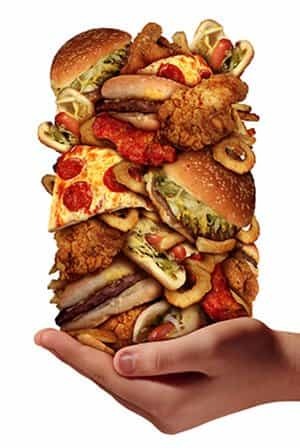 The findings of a 2013 food addiction study show that over 5 percent of the population may suffer from this disorder; however, there’s a lack of assessment of prevalence in the general population, so it’s not certain how many individuals have food addiction. Around the world though, about 1 billion people are overweight. Also, an individual with food addiction can develop a tolerance similar to that associated with drugs and alcohol. The person may need more food over time just to feel the emotions they desire – emotions they used to feel with smaller amounts of food. There may even be symptoms of withdrawal. Cravings can become more intense by avoiding certain foods, or someone may feel depressed, angry, or stressed if they try to abstain from their habit. Comfort foods are often sought out in order to deal with emotions and stress, and this can contribute to food addiction. Addictive thinking comes into play when one eats something to reduce negative emotions associated with events in life or one feels they deserve to have what they are craving. Essentially, the person is viewing food as a solution to an emotional problem in life. While the comfort food may make the person feel better temporarily, it does nothing to address the underlying problem. Brain chemistry also factors into food addiction. Sugar has a strong effect on the brain, and it may stimulate the reward system more than even cocaine and heroin, as found in a Neuropharmacology study on rats in 2011. Genetics can play a role too. In the study, “Addictive Genes and the Relationship to Obesity and Inflammation,” a strong correlation between addictive behaviors, such as drug abuse and alcohol consumption, and overeating was noted. These and other addictive activities, such as gambling, are all accompanied by other behaviors, such as preoccupation and denial. Trauma and post-traumatic stress disorder are correlated with addiction as well. Binge eating on comfort food can therefore indicate other issues that are physical, psychological, and indicative of depression and past trauma. About 23 million adults in the United States, or 10 percent of the population, can be considered to be in recovery, a survey found. While many components go into a comprehensive addiction treatment program, nutrition is an important part of overall wellbeing, and this contributes to sustained recovery. Hence, nutritious foods are advantageous during addiction recovery. During recovery, it’s important to reduce caffeine intake, stop smoking, and get plenty of physical activity and rest, according to the U.S. National Library of Medicine. Poor eating habits are common with substance abuse, so the association alone can increase the chances of relapse. Experts suggest eating low-fat foods; consuming more protein, fiber, and complex carbohydrates; and taking vitamin and mineral supplements. Vitamins A and C can be helpful during recovery, as can zinc. It’s also important to eat at regular times every day. In addition to keeping the body nourished, set eating times also add structure to the day, which is crucial in early recovery. Sufficient fluid intake (during and between meals) is essential to avoid dehydration, which is common during substance abuse recovery. Even though one’s appetite may not be up to par at first, it is typically restored naturally as an individual progresses in recovery. Metabolism, mental health, and organ function can be affected by substance use. While stopping use of drugs or alcohol is a critical first step, more is needed to ensure a full healing process. Nutrients help the body heal and provide it with energy. Immunity is often affected by substance abuse, and healthy foods can fight off infections and help restore the immune system to normal functioning. While comfort foods can make people feel good temporarily, and often conjure up warm memories, those in recovery are best served by maintaining a healthy, balanced diet. Of course, everyone can indulge in a comfort food item from time to time, such as mashed potatoes and gravy or cake and ice cream, but overall, aim for these instances to be the exception rather than the rule.